Ravi (Ravishanker Sharma in real life) is one of those few composers in whose compositions, melody, rather than orchestral embellishment, predominates. 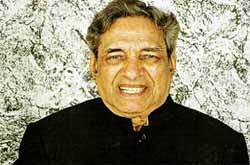 Having started his career with Goel's 'Vachan' in 1955 Ravi scored music in more than 100 films. After the success of 'Chaudhvin Ka Chand' (1960) he was ranked with the major composers of that time. His hummable songs such as 'Ek woh bhi Diwali thi..' sung by Mukesh, 'Wafa jinse ki bewafa ho gaye..' sung by Mukesh are as much popular as 'Sub kuchh loota ke hosh men aye to kya kiya..' sung by Lata, which is profound and steeped in sadness. Ravi who came to Bombay in 1950 to be a singer had no formal training in classical music. Yet as a music director he composed some of the most memorable classical songs such as 'Lage na mora jiya, sajana..'sung by Lata and 'Darshan do Ghanshyam..' by Hemant Kumar, Sudha and Manna Dey. His song 'Jeevan jyot jale..' sung by Asha from 'Grihasthi' won him the Sur Singar Samsad award for the best classical song of the year. It is not an exaggeration to say that Ravi's songs have been beggars' delight as the latter survive by singing his melodies such as 'Ek paisa dede o babu..', (Vachan), 'Garibon ki suno woh tumhari sunega..' (Dus Lakh). During the 33 years of his career, Ravi had his share of success. Unlike some of the modern composers he has not become a part of the rat race. Producers who care for sweetness in melodies still come to him. Ravi gave several hit songs in films like Chaudhvin Ka Chand, Humraaz, Waqt, Neel Kamal and Gumraah. His songs Aaj mere yaar ki shaadi hai, Babul ki duyaen leti ja and Doli chadh ke dulhan sasural chali became very popular in wedding celebrations. He was one of the music directors who shaped the career of Asha Bhosle with songs like Tora man darpan. He was also instrumental in making Mahendra Kapoor a popular singer in Bollywood. He won several Filmfare awards for his music, including for Gharana(1961). After a successful career in Hindi films during 1950s and 1960s, he took a long break after 1970 till 1982. In 1982, he gave music for the Hindi film Nikaah with the song Dil ke armaan aansooyon main beh gaye sung by Salma Agha. In 1980s, he made a comeback as a music director in Malayalam (and some Hindi) films as Bombay Ravi. During 1984, the famous Malayalam director Hariharan convinced him to start a second innings especially for his lovers in South India. The first movie was Panchagni. The songs saagarangaLE and aa raatri maanju poyi (sung by Yesudas and Chitra) were hits. Ravi released some albums thereafter. Ravi has composed for many films produced by South Indian banners - Ghoonghat, Gharana, Grihasti, Aurat, Samaj ko badal dalo (Gemini), Meherban, Do kaliyan (AVM) Bharosa, Khandaan (Vasu films). So his trips to Madras were frequent. In fact he mentions that he was close to the late Sivaji Ganesan. Looking back on life, Ravi gives credit to music director Hemant Kumar and director Devendra Goel for having shaped his career as a music director and acknowledges grateful thanks to his wife (she died in 1988) for having stood by him when he was a struggling 'nobody'. When he feels lonely Ravi gets lost in listening to the melodious music of the 40's. It never fails to rejuvenate him and inspire him to create something worthwhile.